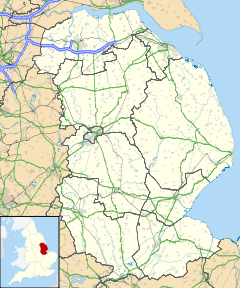 Alkborough is a village of about 455 people in North Lincolnshire, England, located near the northern end of The Cliff range of hills overlooking the Humber Estuary at the Trent Falls, the confluence of the River Trent and the River Ouse. Alkborough, with the hamlet of Walcot about a mile (1.6 km) south, forms a civil parish which covers about 2,875 acres (12 km2). The village of Alkborough was once thought to be the location that the Romans called Aquis but this name is now usually associated with the town of Buxton in Derbyshire (Aquis Arnemetiae).